In 2008, David (left) and Doug led a group of friends on a vision trip to Uganda primarily to create entrepreneurial opportunities for indigenous Christian business graduates. Doug is an entrepreneur and business owner. David is President of The National Christian Foundation East Tennessee. Our group believes that one of our greatest purposes is to exercise our unique gifts and talents to serve God and His kingdom. To this end, many have been encouraged to link arms with us in the various Beyond Relief projects. ​Daniel was born and raised in Uganda and now residing in the capital city of Kampala, Daniel is the majority shareholder and manager of the company, TivaWater Uganda, that distributes the filters to customers in Uganda and east central Africa. He manages the local office, sand production operation and sales team. ​ After serving the people in Romania for a decade, David was compelled to join the journey on the initial vision trip in 2008. With extensive experience in medical mission work, David has been instrumental in guiding and leading our efforts in this area. In addition, he has supported our work with vulnerable children in the slums and villages. At home David is an entrepreneur and business owner. Richard was born and raised in Uganda and is uniquely qualified to lead this exciting business and school. Prior to obtaining his MBA in Accounting at East Central Oklahoma, Richard owned and operated one of our first poultry farms. Richard is a proven leader and a graduate of our partner, Cornerstone Academy. His work ethic and integrity have helped grow the poultry farm into one of the 10 largest farms in Uganda. Edd has been instrumental in developing the comprehensive curriculum for the Chicken City Farms school. Edd and his wife, Kathy, have spent significant time in Kampala to accomplish this work. Audrey has led the FOCUS Child Project for a decade. It supports children from the Mulago-Kalerwe slum community in Kampala, Uganda. These children are supported financially through individual sponsorship so that they have the opportunity to attend school and also be provided with their basic needs. Through various educational programs, FOCUS exposes these children to opportunities that will help them develop spiritually, physically, socially, and economically. Diego is from Guatemala and he studied Business Administration in Broome Community College in New York State. His dream is to help people have a better quality of life. 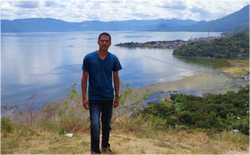 Diego joined TivaWater in 2013 and delivers filters to the poorest communities in Guatemala. Diego has seen first hand how our filter can change lives and is committed to the mission of TivaWater.